During their April 12 Senate meeting, ASWC passed a resolution calling for content or trigger warnings in the future Encounters syllabus. The resolution, which will require faculty approval in order to be implemented, was created in the hopes of preparing students for engagement in particularly difficult materials. “[The resolution aims] … to encourage the mental health of students on campus, and one way of furthering that could be to have some form of notification on a syllabus warning students of [potential triggers],” said first-year ASWC senator Emma Bishop, a co-author of the resolution. The content warning resolution focused on three main areas, namely gun and physical violence, self-harm and suicide, and sexual assault as potential issues for which faculty should consider applying content-warnings in the syllabus. Although some professors already give verbal warnings in classes, the resolution called for written content warnings in order to create a more uniform safety net from potential triggers. “[The resolution] also suggested that [warnings] be written down because verbal content warnings aren’t necessarily reliable, and if it’s up to each professor individually to decide a content warning, then there’s inconsistency among the sections,” said first-year ASWC senator AnnaMarie McCorvie, the other co-author of the resolution. In crafting the resolution, Bishop and McCorvie had conversations with faculty members, some of whom expressed concerns that content warnings would be used in a way to avoid readings. The co-authors contend that the goal of the resolution is actually to enable students to possibly engage in more provocative readings because they would be prepared for potential triggers. 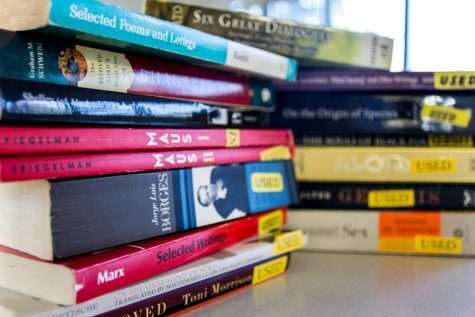 “[The resolution] should allow for more controversial texts to be on the syllabus because you’re giving students the ability to mentally prepare for whatever they are about to engage in,” said Bishop. At this point in time, the resolution has been submitted to the Encounters faculty and will require approval in order to be incorporated into any individual professor’s syllabus. “I appreciate students’ concerns about sensitive discussions in class. I have mentioned such concerns at the meetings of the Encounters faculty and asked the faculty to consider the inclusion of warnings before the reading and discussion of sensitive materials. Given that the curriculum is the purview of the faculty, however, each faculty member must decide the statements within a particular syllabus on his or her own,” said Director of Encounters Gaurav Majumdar in an email to The Pioneer. Even though ASWC members recognize that the adoption of the resolution is the prerogative of the faculty, proponents of the resolution note that it helps open up dialogue about important mental health issues not only inside ASWC but between students and faculty.